Ivan Gilmore, born on 31 March 1918, was the son and only child of JJA and Susan Gilmore. From County Down in Northern Ireland, the Gilmores had long been resident in Surrey. JJ Gilmore was a senior official in the Technical Staff of the Aeronautical Inspection Directorate at the Air Ministry. By some chance, he missed the fatal last flight of the airship R101, his place taken by another AID official. Young Ivan (Bill, to the family) was a keen rugby player, his talent remarked on in the Surbiton school yearbook. A laboratory assistant in civil life, he was still playing rugby for his work team before he joined up in September 1940. There might have been something of a promising future in football had the war not intervened. When Ivan Gilmore entered the RAFVR at 3 Recruitment Centre Padgate on 28 September, he did so with an already daunting Aviation Candidates Selection Board notation from the previous month: not recommended for aircrew. Whatever the reason for this assessment, it seems he was quite a determined lad, and his Form 543A was promptly stamped with the more optimistic mustering of ACH/WOp on entry to RAF Padgate. By the end of the year his trade was noted as Wireless operator. After a brief stint there and at 10 SRC Blackpool, early February 1941 found Aircraftman 2nd Class Gilmore posted to 2W2SS Signals School. Ivan is eight from the left, squatting in the front row. This photograph is in the familiar style of other Blackpool trade course shots. While many of the men have their eagle shoulder flash up, many do not. The only indication of rank or authority in this shot is the brassard worn by the central figure in the middle row. All indications are of a group of new airmen. By June 1941 he was posted to 116 Squadron but the stay was brief. Reclassified to Aircraftman 1st Class on 1 September, later that month came posting to an Aircrew Reception Centre (a very hopeful sign). In the second week of October, AC1 Gilmore was duly posted to 1 Initial Training Wing. His determination had gained him a place on the path to qualification as aircrew. In mid December 1941, Ivan passed out of 1 ITW and on to 1 Elementary Air Observer’s School at Sunningbourne. By New Year’s Eve 1941, he had achieved reclassification to Leading Aircraftman. In February 1942 LAC Gilmore was at 2 Signals School. With paperwork lagging slightly in the Adjutant’s Office, it was late March before his remuster to Under Training Air Observer/Wireless Telegraphist was put on record. Passing through 50 Group Pool of Flying Training Command at Reading, by late June 1942 his initial Observer training was complete. Promotion to (temporary) Sergeant and remustering as a qualified Air Observer followed, then posting to 3 School of General Reconnaissance at RAF Squires Gate on 27 June. Late August 1942 found him on the last lap, at No 2 (Coastal) Operational Training Unit Catfoss, near Edinburgh. So much for the 5 ACSB notation! As captioned by Ivan: No 2 Beaufighter Course and No 20 Blenheim Course. A mix of Pilot Officers and Sergeants, there are 15 Pilots and 18 Observers. 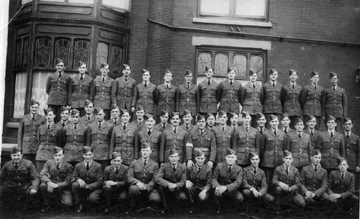 At far left in the front row is Sgt Fred King, who also appears in one of Ivan’s Middle East photos, below. 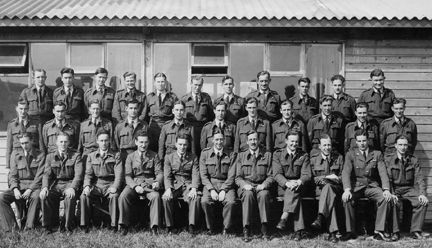 Fifth from the left in the centre row is Sgt Observer Moss, who as F/Sgt John Moss was also lost on 211 Squadron operations. At far right, in the back row is Ivan Gilmore. The photograph also carries a full list of the course members (surnames only, left to right). Front: King, Roberts, P/O George, P/O Wilson, P/O Buckley, P/O Burdett, P/O Langley, P/O Willey, P/O Hickie, P/O Payne, Graham-Smith. Centre: Highfield, Perry, Dodd, Chalk, Moss, Sar, Goodwin, Budd, Humphries, Denny, Worrall. Rear: Thomas, Winsor, Hawkes-Reed, Yates, Hey, Tullock, Baldwin, Davies, Cakebread, Canner, Gilmore. For some reason, the stay at 2 OTU Catfoss seems to have been protracted. Given his own notation of the combined nature of this course, it may be that he converted from the Blenheim to the Beaufighter during his stay there. John Oblein also undertook two OTU stints, in Canada and the UK, for the same reason. Generally, Bill Glimore might have expected to have a stint at at Ferry Training Unit with his pilot before undertaking a long ferry flight to the Far East. His musterings from late 1942 onwards reflect the state of play in the RAF at that time: alternately recorded as Observer and Nav/W. 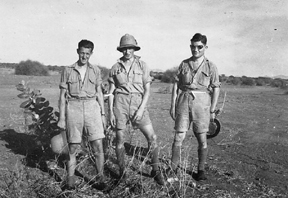 While it was common practice for aircrews to ferry their own aircraft from the UK, across the Middle East and on to India (as experienced by John Oblein, Alan Carter, and Fred Wood, for example), it appears that Sgt FJ Fred King and Sgt IAW Bill Gilmore may have been members of a draft originally intended for 176 Squadron, about to form as a Beaufighter unit in India at Dum Dum near Calcutta in January 1943. Apparently sent by convoy to Takoradi, it appears that King and Gilmore then flew on to Egypt, either as passengers or as ferry crews. 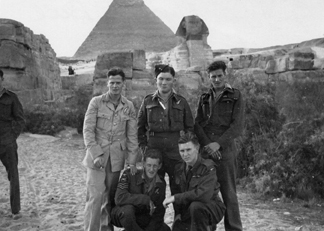 In these Gizeh Pyramid shots, all the men are Sergeant aircrew: Observers and Pilots, with Ivan and Reg clearly showing the Wireless Operator’s fistful of sparks patch too. In the 2-seat Beaufighter, the fellow in the back seat was both Observer and Wireless operator, and soon the title of this crew function (and its badge) would change accordingly, to Navigator/W (Nav/W). 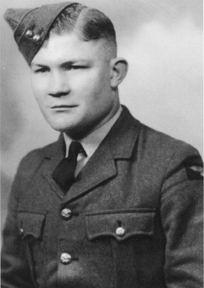 Ivan was promoted to (temporary) Flight Sergeant towards the end of June 1943, by which time he was in India. The crown and chevrons of a Flight Sergeant are nowhere to be seen in these shots. Reg, Geordie and Bill all wear the Observer’s winged O. Bill and Johnny are Sergeant pilots. To confound easy comparison with the Catfoss course shot, some of the boys (Ivan, Bill and Johnny) wear their stripes on the right sleeve only. Reg’s Wireless Operator’s fist full of sparks badge is clear, above his stripes. Who is standing just out of shot? Two crews? Ivan (with Observer’s winged O and Wireless Operator’s sparks badge), Johnny (with Pilot’s wings), Reg as Sgt Observer, and Bill with Pilot’s wings. Three crews? 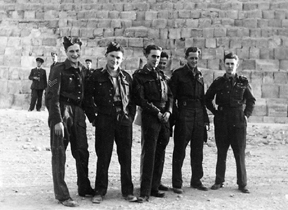 Three Pilots (Bill, Fred, Johnny) and three Observers (Ivan, Geordie and Reg). With only King and Gilmore fully named, tracking these men in 211 Squadron records is going to be rather difficult. 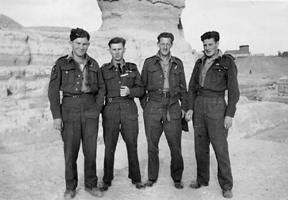 Ivan, Fred and John Moss are readily identifiable, from the earlier RAF Catfoss No 2 Beaufighter course photograph. Commonly, a crew formed at OTU would stay together, for the ferry flight and on posting to a Squadron. However, it is not possible to say which of these men were crewing together at this point. These men therefore seem likely to be Beaufighter crews, perhaps taking a break before their long flight on to the Far East. At the end of January 1943, Fred King and Bill Gilmore were at Edku, on the Delta coast less than 20 miles from Alexandria. From there they departed for India, ferrying one of a group of five Beaufighter VI aircraft: EL351 (sic—perhaps EL350), EL442, EL 450, EL456, EL471. Rajasthan in North West India was then far from the war. But there, at Jodhpur, 319 Maintenance Unit had recently arrived from Peshawar. On 9 February, the five Beaufighters were handed over to 319 MU. All were destined to serve with 27 Squadron at Argatala, near Bengal on the other side of India, during 1943. From August 1942 to October 1943, RAF Records staff made no entry on Gilmore’s Form 543A to show his intended or actual postings, however, other accounts since received show that all five Beaufighter crews were posted to 42 Squadron on on 13 February 1943. Having left the United Kingdom in June 1942 with their 4-man Beauforts for the Far East, the 42 Squadron Air Party had been waylaid for a brief torrid stint on Malta, before a period re-organising in Egypt to finally reach Ratmalana in Ceylon in mid October 1942. By early December they were at Yelahanka, moving to Vizagapatam at the end of the year where they were to convert to the Bisley—the Blenheim V—during February 1943. In the process, the two-man Beaufighter crews gained one of the now-spare Beaufort WOp/AGs, thus making up the familiar three-man Blenheim crew: pilot, navigator/bomb-aimer, gunner/wireless operator. Sgt Fred King and Sgt Gilmore were thus joined by Sgt McCubbin from F/Lt Gee’s crew. But by October 1943 the role of 42 Squadron was changing again. They began converting to single-seat Hurricane IVs for fighter/ground-attack operations. Certainly the change from the unloved Bisleys appealed to Fred King, who by year’s end was on the pilot’s roster as Flight Sergeant. The break-up of the crew may not have appealed so much to Bill Gilmore, however, the conversion process may have recognised the need for some navigation refresher for the “new” Hurricane pilots, who would now have to find their own way about. In the necessary shake-out of 42 Squadron aircrew, the next entry in Bill Gilmore’s Form 543A movements record was thus to 42 FC Section in October 1943—from the crew records, it is now seems possible that this cryptic short-hand referred to 42 Squadron Fighter Conversion Section. It was December before the Squadron was ready to begin Hurricane operations and about this time Bill Gilmore left them. On 23 December 1943 he was at 308 Maintenance Unit in Allahabad, writing home to his cousin Anne Warnock, then serving in the ATS in Belfast. That letter indicates that he had by then been in India for some 9 months and already had some operations under his belt. The exigencies of war perhaps played a part in the sparse record of Bill Gilmore’s Indian postings: they may reflect records lost in transit. As remarked elsewhere, the setting up of the Beaufighter Squadrons in India and Burma was protracted and there was some shuffling of personnel between 308 MU, 177 Squadron and 211 Squadron for example. By August 1944, a W/O JF King was serving in 177 Squadron, another Beaufighter unit at Chiringa: 211 Squadron were there for a period around July. At first blush, possibly the same Fred King of 2 (Coastal) OTU and the Middle East, but given Gilmore’s later remarks this may not be the same man. In writing to Anne, for the most part Bill Gilmore intentionally kept the tone of his letters light. However, in sending the Middle East “snaps” with his first letter to Anne in December 1943, he had given a frank insight into the risks they all faced, quietly noting that his companions in the Middle East were by then all dead. Sadly, there is not enough information to describe the circumstances of their loss. Apparently “somewhere in India”, as they then said. It is difficult to know where exactly, and with what unit, these photographs are associated. Reg and Bill appear again in this shot, though by December Ivan had remarked on their death. His letter of 11 February 1944 mentioned the Middle East photographs again, noting that the Middle East shots had been taken over a year before. That would place them sometime between November 1942 and January 1943. While the return address of this letter was still given as 308 Maintenance Unit (then in Allahabad, on the Ganges), at that date Ivan had already been posted to 211 Squadron: with effect from 1 February, according to his Form 543A movement record. The Squadron was then based 600 miles away at Bhatpara, south-east of Dacca in what is now Bangladesh, for operations over Burma. It may be that he was attending the SLAIS rocketry course during February, or that he was awaiting transport to the Squadron, who in January and February were picking up new crew-members by air using the two available Bisleys. However he reached them, by 16 March Ivan was writing home again from 211 Squadron, clearly having arrived only a few days earlier. From 6 March 1944 to 14 March 1944, the Squadron had lost 4 Beaufighters and their crews in individual operations, and one Aircraftman in a Sten-gun accident on the ground. It seems from the Squadron Operations Record Book that Ivan regularly crewed with 1213620 F/Sgt Geoffrey Preston Davies from 15 March 1944, with four operations together that month and three the following month: 8 April to Chiengmai to attack the railway junction, 26 April to attack the Kinu-Monywa railway, and their last together on 29 April. There are no other ORB entries for either man. The Squadron had resumed operational status only in January 1944. Could this be Ivan’s pilot, Geoff Davies? From the kukri knives, clearly somewhere in India. Perhaps we can suggest Bhatpara. In their first operation on 15 March in Beaufighter Mark X LZ231 ‘N’, with three other aircraft they attacked a bridge at Lamu with rockets. Hits were observed and although they left the bridge holed, they found the results “disappointing as with most RP attacks on bridges”. The task on 21 March was to attack communications and movements, whether road, rail or river, from Prome south to Ple. Again in LZ231 ‘N’, Davies and Gilmore attacked railway targets with Waddell and Woodall in LZ515 ‘X’. After damaging five factories with their rockets, near Gyobingauk they attacked a train with cannon-fire and destroyed it, the locomotive and trucks exploding. The four aircraft involved all returned safely at ten to two in the afternoon after nearly seven hours in the air. On 24 March, four aircraft operated singly in attacks upon the Japanese Air HQ at Kalawa and the Thazi-Mingyan railway. In Beaufighter Mark X LZ515 ‘X’, Davies and Gilmore returned safely from the operation, though without finding the target due to compass trouble. Ivan’s close friend Flight Sergeant John Moss in Beaufighter Mark X LZ136 ‘O’ and his Canadian pilot W/O Bill Adamson failed to return. Ivan later wrote to John’s mother Hilda, which she greatly appreciated. Although less activity was seen in a five hour sortie by four aircraft on 28 March, attacks were made on river craft, and some railway rolling stock and a bridge were attacked with rockets. In Beaufighter LZ515 ‘X’, Davies and Gilmore returned safely as did the three other crews. In another five hour, four aircraft sortie on 8 April, Davies and Gilmore in Beaufighter ‘Y’ (probably LZ527) were tasked to attack Chiengmai railway and targets of opportunity. All aircraft returned safely from a wide-ranging raid in which a variety of targets were destroyed including a Hawk III aircraft, with one locomotive damaged. With four aircraft operating in pairs on 26 April, Davies and Gilmore in Beaufighter ‘N’ and F/O Stevens with F/O Parker in ‘V’ strafed the Kinu-Sagaing-Monywa railway and river craft south of Monywa. All returned safely after three and a half hours in the air. On 29 April, four aircraft were slated to attack communications in pairs in the Gangan/Pakokku/Kaleneyo/Kalewa area. Taking off from Bhatpara at 0653 hours, the second pair attacked targets at Minya and then a bridge at Malwe. In the course of this attack, Beaufighter ‘N’ of F/Sgt Davies and F/Sgt Gilmore was seen to crash and burst into flames, observed by F/Sgts Bell and Lightfoot in aircraft ‘V’. The Operations Record Book at this date only records aircraft call-sign letters rather than serial numbers. However, the Sortie Reports eventaully came to hand to show that Davies and Gilmore had been flying NE300 ‘N’ on the day they were lost. Posted “missing, believed killed” it was not possible to recover the boys’ remains then or post-war. The month had been a busy one with 108 operational sorties mounted by the 12 to 15 aircraft available. The Squadron’s casualties during the month, as recorded on the India and Burma page, were regarded as light. In the meantime, Hilda Moss had written in thanks to Ivan, only to find her letter returned. On receiving this news, she wrote in sympathy to Susan Gilmore. Susan died in 1980. Ivan, an only child, was single when he died. It is thanks to his cousin Anne Warnock and her daughter Caitlin Masheder that Ivan’s place in the 211 Squadron story can now be recounted. C Burningham correspondence with author re January 1943 ferry flight, 42 Squadron ORB, and Jack Denny of 177 Squadron. 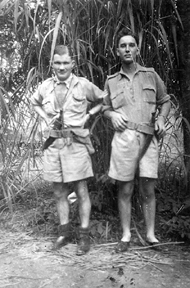 Ivan Gilmore and Geoff Davies, like Bill Adamson, John Moss and so many others, are commemorated on the Commonwealth War Graves Commission website, and on the Singapore Memorial in Kranji War Cemetery.